Page Two Books, Inc., 9781989025055, 40pp. 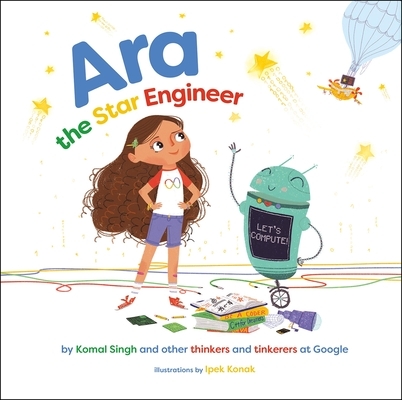 This is a STEM book and more An inspiring, inclusive, whimsical way to learn about computers and technology from real-life trailblazers. Ara is a young girl who loves BIG numbers. She wants to count all the stars in the sky... but how? This is an upbeat adventure of Ara and her sidekick droid, DeeDee ("Beep "). They use smarts and grit to solve a BIG problem and discover an amazing algorithm A quest that takes them through a whirlwind of intriguing locations at Innovation Plex -- Data Centre, Ideas Lab, Coding Pods, and X-Space. Along the way, they encounter real-life women tech trailblazers of diverse backgrounds, including a Tenacious Troubleshooter, an Intrepid Innovator, a Code Commander, and a Prolific Problem Solver. They tinker-and-tailor, build-and-fail, launch-and-iterate, and in the end discover an amazing algorithm of success -- coding, courage, creativity, and collaboration ("Beeeeep "). "'If she can see it, she can be it.' With this story, girls can see leaders and be inspired to become one. A book for all ages and genders " GEENA DAVIS, FOUNDER AND CHAIR, GEENA DAVIS INSTITUTE ON GENDER IN MEDIA.